This has already been available for more than a week...but my newest Japan Times column is about my sticky smelly fermented bean product, natto. It also includes a recipe for natto-potato fritters, which is approved by the in-house natto hater (aka The Guy) as being "quite edible, with minimal natto-ness". I hope you give it a try, especially if you've been thinking about trying natto for health reasons but have been wary about its reputation and scary sticky stringiness. Submitted by maki on 2014-02-28 10:47. A very nice article as always! May I ask about natto availability here in Europe, or, it might be better to ask, in France? I haven't seen it in Asian grocery shops around here at all. I hope you get better soon. Cancer is a pesky one. 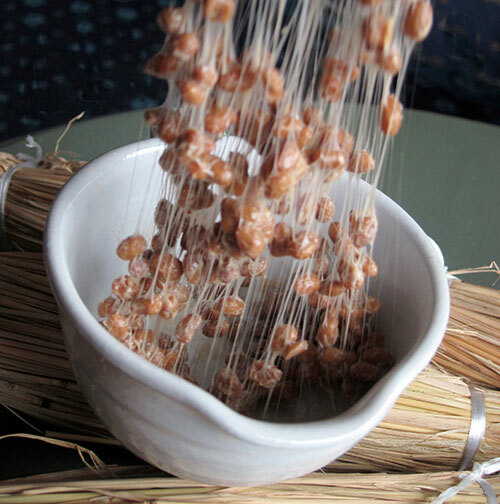 In France we are in luck - there is a guy who makes natto! I wrote about him here - link, Natto du Dragon. Pretty strong tasting but good natto! Love the picture of the mega-strings! Since they feel like spider webs to me, I eat natto straight from the freezer to try to avoid the sliminess. Wishing you well and hope you're feeling better. You have a positive mental outlook. Glad you're up to blogging. I'll bet the nice sticky, stinky natto will help. Best wishes! Thank you for this new post despite being sick! I hope you get better soon. I love natto but here in Australia we can only get small portions that are frozen- I did find a book in the library with directions for making it- but it was too scary to contemplate. Stuff kept a long time at a warm temperature for fermenting can also pick up nasties so i'd feel better getting natto from a professional operation. Sorry you are still feeling unwell- there are many people in the net-world who are wishing you the best - I hope their brain waves are reaching you and helping you to feel less isolated. Luckily we can buy natto from Japan,frozen, here in NZ. From time to time I use a purchased pack to seed a homemade batch. I'm no fanatic but there is something about making fermented goods that appeals to my science/farmer side (for me that is natto, sourdough bread, kimchi, and composting/worm farming). The microbiology I studied at university would have been more fun if we had experimented with such things! My favourite natto dish is a donburi: natto, sashimi and a raw egg over rice. 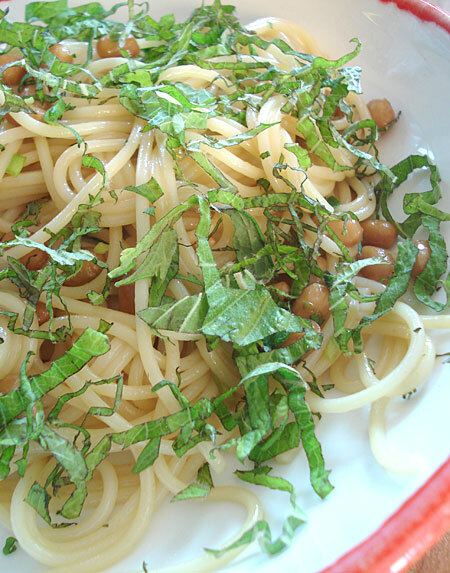 But for lunch today your post has me wanting natto spaghetti. Here's to a better March. 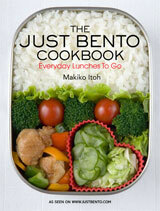 Thank you for your post on Natto! I have been enjoying natto with rice for several years, ever since my wife introduced it to me. It looks disgusting (like drippy snot), but it adds a great taste that is not duplicated by any other food. One of my favorite natto dishes is natto with mustard. I know natto has several health benefits, so I hope you comtinue to eat it, and I wish you the very best of healing and health! Maki-san, I read all of your posts in the Japan Times but couldn't help laughing over how timely this one was. I JUST started eating natto a few weeks ago (for health reasons) after years of thinking it smelled like feet. :) Now I love it with fresh shiso leaf and a bit of tare sauce drizzled over top. My American friends find me crazy but it's my new go-to food! I hope you're feeling better. It's always lovely to read your work. Really sorry to hear you've had a poor month, health wise. Hope the treatments are going well and the flu is a thing of the past very soon. I didn't think I'd like natto but last time we went to Japan, in October/ November 2013, I had it in a dish I really liked - we went to a horse meat specialist restaurant in Kumamoto and one of the courses in my feast was a horse meat tartare with natto. I really liked it as it essentially worked as a tasty condiment to the sweetness of the raw meat. Wonderful! I am just commenting to say that it is wonderful to hear from Maki-san again! I don't often comment but I have been following your blogs for a while and have been encouraged to end-of-year soba and other simple things from them. Best wishes for a speedy recovery! Hmmm.... Its looks good actually. This is something I may have to try soon. Quick question: Would you happen to have a recipe for how to make Japanese Crepes? The ones you get that are similar to street food. They make them in the mall and you walk away with it like Americans do an ice cream cone. I have been trying to find something similar since leaving Japan, but am unsuccessful every time. For Japanese crepe ideas check out Cookpad in English. Search under crepe. The recipes are translated from ones submitted to the Japanese Cookpad site. Thanks so much! I will try today!!! A-ha, my new portion of natto still has a few hours to go. I wish I could get these lovely small soya-beans. Even so, my wife says that the natto I make is really good, similar to the original. I recently started steaming soy beans instead of boiling them. It seems to make for more solid soy beans, less mushy. I believe the soaking time to influence the end taste and consistency. I love natto, straight from the pack. I wish it came in bigger packs where I am, though; the small individual syrofoam packs seem wasteful. I've tried making it once, but it never properly fermented. My toddler and I *love* natto, and we are not even Japanese. It was love at first taste for both of us. My son ate natto since he was able to eat solid (maybe a bit older than a year) and his favorite breakfast is still hot steamed rice with natto and chopped green onion. Our Japanese grocer used to stock local/semi-local natto, nothing beats the taste of fresh natto compared to the frozen kind, in my opinion. My best wishes for your health, Maki-san! I LOVE NATTO. I lived in Japan for a year and the first time I tried it (seven years ago) was with a group of 1st graders who were eagerly waiting for me to spit it out. Much to their surprise, I liked it right away, but it wasn't a LOVE. About a week later, I was CRAVING it like crazy. It was like my body needed it. I eat it as much as possible now (and I actually just had it for lunch today!) I'm lucky to live in Southern California where I have access to all sorts of natto, otherwise I don't know what I would do! Healthy thoughts to you, Maki! Hmmm...natto. I love the stuff. Yes it's odd to a pallet not used to it, but I find it really savory and satisfying, and the bitterness reminds me of coffee. At a restaurant I like they serve a natto & rice omelette and it is one of THE MOST DELICIOUS things I've ever eaten. It mellowed out the beans in a lovely way. I think there are so many culinary possibilities with this unique ingredient and I predict it'll soon be the next big thing.